2018 - definitely not the year of the potato! Let me tell you a little story about potatoes and rolling with the punches. This past year, we got ambitious (well, I got ambitious, we’ll spare Greta from this one) with our new property; we needed something to fill up some space so we could get the ground worked that we knew we could sell that could also be easily maintained. After a little convincing, Greta agreed with my choice...potatoes. They can be mechanized, they’re easily stored for extended season sales and they’re relatively popular. 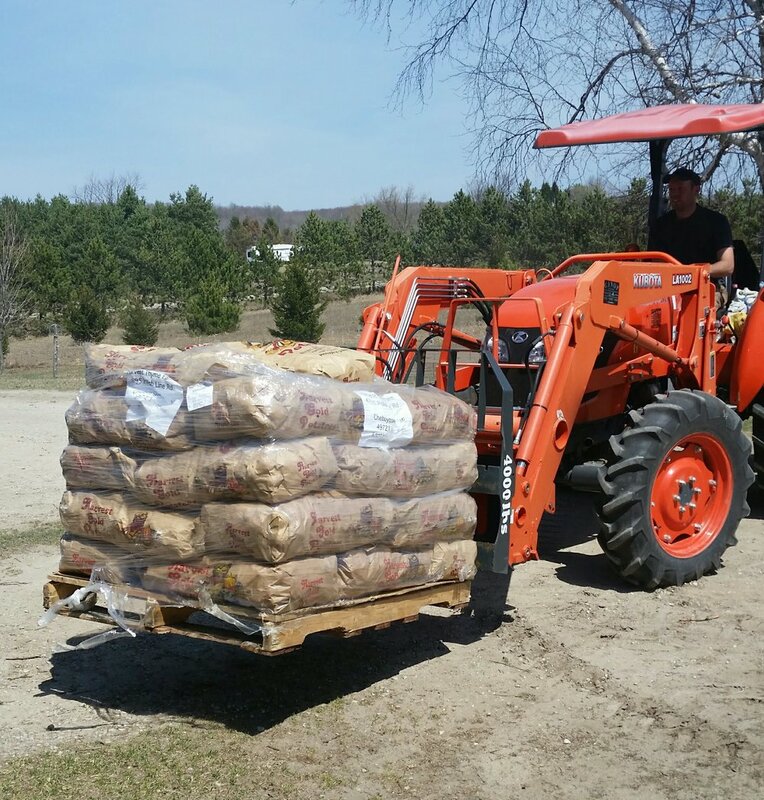 So, we ordered some seed potatoes and a couple months later they showed up, all 1,350 pounds of them; twenty seven 50# bags, a bit of a jump from the 300# the year before. The good news: they showed up right around when we requested; late April when we usually plant them. The bad news: there was still a foot of snow on the ground. Thus, obstacle #1: where are we going to store all of these potatoes before we can plant? By now, we expected to have the ground all worked up on the new property and ready to plant, but the tractor was still in the barn and we weren’t going to be ready to plant anytime soon by the looks of it. So, we stash the potatoes in the coolest, darkest corner of the garage we could find; we’re simply not set up for sitting on ¾ of a ton of seed potatoes. The potatoes sat that way for a long four weeks while we waited to get the ground prepped. Obstacle #2 was still waiting; how are we going to get this many potatoes in the ground? I had a plan, but I also know from experience that little goes according to plan in farming, especially when you’re trying to use a tool for something it’s simply not meant to do. Greta gave me the ‘you’re crazy’ look, and off I went with added motivation to turn the rear cultivator for the tractor into a potato planter. A few hours later with the help of a lawn mower seat, steel, rope, lumber and some PVC, I had what theoretically should be a fully-functional potato planter. Next step; figuring out how to get the right spacing on the potatoes. To do this, I need to know how slow I can really make the tractor go. This is one of those tasks that is nice when you don’t have neighbors watching, because, well, I’m sure it’d look a bit ridiculous. Nonetheless, on the tractor I go; stopwatch app on the phone and I’m off to the races...or something like that. Four minutes and twelve seconds later, I have my answer...9.5” per second. I won’t make you do the math; in that four minutes, I traveled a staggering two hundred feet; slightly over a half of a mile per hour. There’s nothing quite like having a million things to do and thinking about practically every single one of them in the time it takes to travel just 200 feet. It’s now written in our tractor manual so I don’t have to repeat that mind-numbing task anytime soon. Nonetheless, I now have my number, which is close enough to the 9” spacing that we’re aiming for that I know we need to seed one potato every second. Now how do we keep that pace? There must be an app for that right? I mean, after all, who doesn’t plant potatoes like that? To the Google Play Store I go! Of course, I wasn’t hunting for a potato planting app, but thanks to those more physically fit and technologically savvy than myself, I managed to track down a HIIT (High Intensity Interval Training, I’m sure you wanted to know!) app that I could configure to beep at one second intervals. So now we’re ready to go. A bit crude, sure; but better than a shiny, new $5,000 one-trick-pony potato planter that’d sit in the barn for 364 days out of the year. Planting day came eventually; around a month later than planned, but by then, we were ready. We loaded up the potatoes in the trailer and off we went. We still have a couple more tasks before we can plant. We need to spread the fertilizer and we need to cut up the seed potatoes. Spreading fertilizer isn’t a huge task, but cutting up 1,350 pounds of seed potato...a whole different story. The ideal seed potato is around 2 ounces with 2-3 eyes (the little sprouts when you keep them too long) with no more than two cut sides. Someone should tell the seed potato companies this fact because we end up with everything from too small to softball-sized behemoths. So we started cutting; the sprouts on the potatoes were way larger than we’d ever had to deal with after sitting for so long, but we made the best of it. Cutting them is a bit like a race to deconstruct a puzzle as each piece, cut from a whole potato, needs to meet both the weight, eye and cut count. As much of an art as it is, there is a right way and a wrong way to do it and well; don’t take too long because cutting potato seed never made anyone any money! So now we test out obstacle #2, the planter. Lucky for me, just a few quick adjustments and we’re off and running...you know, at the breakneck pace of ½ mile per hour. Well, I guess that’s a matter of perspective. You remember that whole one potato every second thing? Well, they weren’t going to put themselves into the planter and Greta got the fun task of making that all happen. I’m sure many of you saw that video on Facebook; let’s just say that her day was a little busier than mine. Nevertheless, by the end of the day, we did it; over 8,500 pieces of potato cut and in the ground and ready to grow. And grow they did! In just a week they were poking out of the ground. Thanks to their haste, I got to meet one of our new neighbors that stopped over because, like us, he was astounded how fast they came up. The weeds came too, but we were prepared. 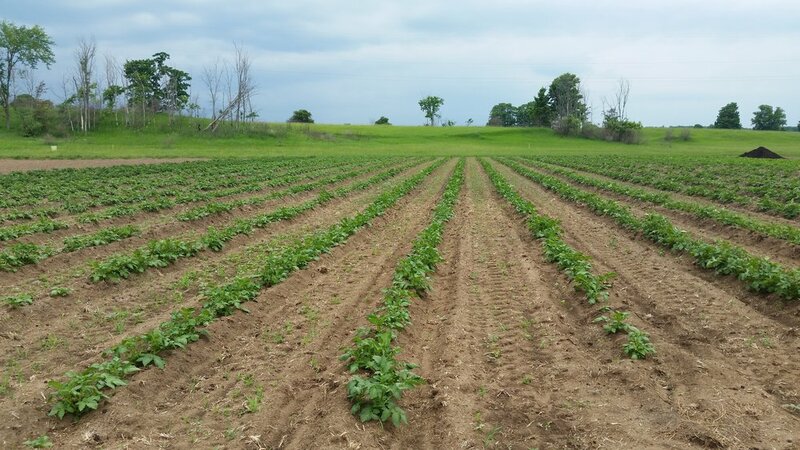 A month in and we had the most spotless potato field in northern Michigan. Of course the season didn’t stop there, but the rain sure did. You see, after a wet and miserable 2017, we upgraded our rain gear over the winter. Jokingly, in January I made the comment that with this fancy new rain gear we could be sure it wasn’t going to rain in 2018. Now that it’s here, it’s not quite so funny. Potatoes are one of the biggest water users on the farm and given the holdup on our FSA loan it was obvious a well wasn’t anywhere in the picture; we sure didn’t have the $30,000 on hand to drill it. Weeks went by with us hoping for some rain; these water hogs must need it by now, right? We could dig down four...six...eight inches and it’d be bone dry, but you wouldn’t know it by looking at the plants; green, tall and totally healthy looking. Problem was, they were just getting ready to start putting potatoes on and their water needs were about to increase exponentially. So, like always, to the calculator I go. We have a few 300 gallon tanks on hand from our lawn fertilizing days in Tennessee; surely we could use those to get us through temporarily. One inch of water x ¾ of an acre of potatoes x 27,000 gallons per acre inch = ~20,000 gallons per week. At a half-hour round trip, it’d take nearly 45 hours a week, obviously not an option given it’s only a small part of what we’re doing and we’re surely not going to pay someone $700 per week to haul water. So, what if we could run some large diameter layflat hose from our current property to the potatoes a half mile away? Well, it could be done, but it’d cost around $3,500. An expensive fix for a temporary problem. Looks like it’s time to just accept the situation, hope for some rain and move on...nothing we’re going to do here. In the following weeks, the occasional rain cloud would come our way and we’d watch it die out or go right past us. We watched the huge squash leaves wilt in the summer sun because there was just no water to be had to replace the evaporation loss, surely it couldn’t be good for the potatoes right next to them. It’s a tough feeling knowing that you simply have no control over the situation, yet the situation is the one that’s supposed to help pay your employees and all the other bills. A disheartening experience for sure, but it is what it is. This went on for a long three months; every day things would get a little more pathetic but we’ve got a million other things to do and dwelling on this isn’t going to help anything. There comes a point that you start avoiding the situation just to avoid thinking about it all; when things were going well, we’d be down there every other day, by now, we’ll pop in quick once a week. By August, the moment of truth came, time to dig some samples to see what we’re dealing with down there. A few plants of each variety, weighed out and extrapolated across the field with the help of that trusty calculator and in front of me sat a number I never expected to see...10,000#. We knew the plants looked pretty healthy considering the whole no rain situation, but that’s about the heaviest yield we’ve ever seen; just shy of 1.5# per foot. We planned for a pound per foot; so now, what are we supposed to do with all of these potatoes? Of course, when we planned and ordered these potatoes, our loan had already been approved so we anticipated that our building would be constructed and ready to store them by now, but here we are, a wide open space where the building is supposed to be. One thing’s for sure, 10,000# of potatoes won’t fit in our 8’x10’ walk-in cooler. Not a terrible problem to have; we’ll find a way to deal with that when the time comes, right now there’s too many other things worry about on the farm. So, the stress is off, we’ve got a nice big pile of potatoes out there and we’ve just got to wait for them to mature and toughen up a bit so we can harvest them without ripping all the skin off. Of course, they’re running behind schedule from the late start because of the snow and the summer drought, but things are coming together. Finally! To top it off, here comes the rain, now that we don’t really need it. Three inches in one day; where was that all summer? Surely, the potatoes are finally enjoying all that rain. At last, it’s time to try out our new potato digger; a nifty mechanical contraption that digs the potatoes and lays them on the surface of the ground so we just have to go back and pick them up. A big improvement from our previous method of using a plow blade to loosen the soil then having to dig around by hand and find them. Our early red potatoes came up without much of an issue, a bit small but otherwise fine. Next up, the early gold potatoes. Man, look at those potatoes! No small ones and lots of big baseball-plus sized ones. Perfect! Or so we thought without closer inspection. You see, this ground was previously a hay field for years and there are a couple pests that call hay fields home where they feed on grass roots; grubs and wireworms. The grubs are not such a huge issue, they can be a one year problem that we anticipated, but the wireworms? They’re the larval stage of the click beetle, not a huge problem in and of itself, but they remain in this voracious underground eating form for seven years before pupating, with literally not a single pesticide, organic or otherwise that can stop them. Yeah, we research our enemies extensively, but this one looks like an armor-plated worm and is about as tough to kill as that sounds…. we’ve been outmatched. We’ve dealt with them here and there in the past, but nothing to be all that concerned about. This year, however, was different. With the lack of rain, they sought out any moisture they could find and the only moisture that could be found was inside of those potatoes. They eat their way through the potato, leaving little tunnels of brown rotted flesh behind, enough to make them unmarketable. Thousands of potatoes, wasted. Well, nothing we can do about that, leave those behind and pick up what’s left. But before we do that, we should cut a few open, just to make sure we’re not missing anything, right? After five or six potatoes cut open, we’ve got yet another big issue...hollow heart. Really? At this point it feels like the potato gods must be conspiring against us or something. The culprit? That three inches of rain in one day following the longest drought we’ve seen since we started farming. The shock of the rain causes a strange reaction in the potato as the outside grows faster than the inside, leaving a hollow, water-soaked brown core in the center of the potato. Certain varieties are more susceptible than others. As it turns out, this one unfortunately is one of the most susceptible and also the one we planted twice as many as any other varieties, go figure! The biggest problem? Not every potato has it and since it’s contained to the core of the potato, there are no clues to which ones have the problem. It seems to be a size thing, so we cut open 30 or so pounds of potatoes and sort them by size. Turns out we’re onto something, the small ones seem to have escaped unharmed; presumably they were just getting started when the rain came. Well great, the smallest, lightest potatoes are the good ones. By now, we’ve lost nearly ¾ of the potatoes, so that 10,000# has presumably dwindled to around 2,500. I’m still not sure if it’s worse to have no rain and expect no potatoes or have lots of potatoes and find out they’re no good, but either way we ultimately ended up with the latter. These were the most expensive potatoes we’d ever dug, each one had to be sorted by size then inspected for wireworm damage. But, we’ve got bills to pay and some potatoes are worth more than no potatoes. So, we take what we can get and move on; nothing to see here. As we get into late September, we dig into other varieties and while the wireworm damage subsided some (we presume they migrated to where the other potatoes were because its the wettest - least dry?- ground on the property) and the hollow heart wasn’t a problem, we ran into a whole new issue...mutant potatoes. We had some of the oddest shaped potatoes you’d ever see. There was one recurring shape, something like a barbell. It appears as though the initial potato grew and soaked up all the moisture it could find but as the drought lingered, the growth stopped. With the new heavy rains, they were off to the races again, but instead of bulking up the existing potato, they started growing another one off the end of the previous one. Sometimes not just another one, but four or five. While they were amusing to look at and Bridger didn’t mind playing catch with them, they sure weren’t any good; they’d never make it through the barrel washer intact and they’d undoubtedly be a tough sell. So, on we go, bagging the few remaining good potatoes. At least we had some! Some of the potatoes got dug in the snow (a first for us), others just never matured in time before the ground froze and lots got left behind, making for some very fat and happy deer. 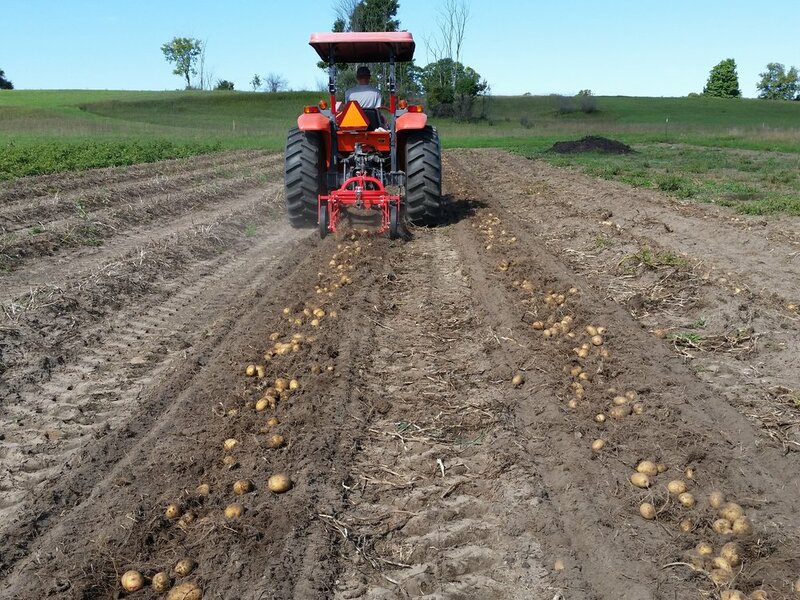 By the time the season was over, we ended up with around 3,500# of potatoes, a far cry from the 6,400# we budgeted for and the 10,000# we thought we had. Let’s just say we were pretty happy we weren’t exclusively a potato farm at that point. But that’s how farming goes sometimes, you accept it, learn from it and move on; it’s probably the most important thing we’ve learned on the farm. Things are always going to go wrong when you can’t control all of the variables, so focus your energy where it’s needed, not wasted, because there’s always plenty to do. While we haven’t perfected the art, we’re surely getting better at it with each bad potato! Fast-forward to now, our well is finally drilled and the building is started, but the FSA office has been closed from the shutdown and our builder is out of money to keep going. So for now, instead of dwelling on the holdup, we’re focused on getting the rest of the farm ready for 2019, potatoes and irrigation included. Perhaps, we’re just a bit blindly optimistic about what the future holds, but we’re looking forward to an exciting new season. It's just a little dirt!